Medical treatment is very effective in controlling most symptoms of Parkinson’s disease. Most patients can carry out their daily activities on regular medications for 5 to 10 year with the help of proper medical management. A stage is reached when drugs alone cannot give adequate relief and patients’ day is interfered by repeated and sudden “off” periods. Some patients develop flowing body movements after taking medications -called dyskinesia. “Off” periods and dyskinesia are two phases of advanced Parkinson’s disease where drugs may be less effective and surgical options have an important role to play. What are the various surgical targets for Parkinson’s disease surgery? 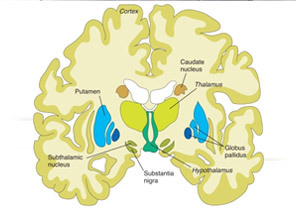 The 3 nuclei which are targeted in Parkinson’s disease are namely; the globus pallidus (Gpi), the subthalamic nucleus (STN), and the Vim nucleus of the thalamus. Options for treatment include the implantation of deep brain stimulators in one or more of these three areas (Gpi, STN, and VIM). Recently we have developed a technique of lesioning the STN nucleus (Sub-thalamotomy). The advantage of this is that it does not require implantation of electrodes and pacemaker and thereby reduces the cost. However, the flexibility of titration (adjustment) of therapy available from the DBS is not available. Who is not satisfied with his/her level of control of Parkinson’s disease. Has had an adequate and reasonable trial of medications is a candidate for surgery. So who is the candidate for STN Lesioning? Presently we offer this surgery for patients below 65 years. Patients who cannot afford DBS surgery or have difficulty in getting access to physician for post DBS programing may benefit from this. What are the advantages of Parkinson disease surgery? The advantages of surgery are related to the improvement indisabilities that the patient suffers from Parkinson’s disease. The activities of daily living improve, patient can resume his/her work and patients who are severely dependent on others become independent. It improves most of the symptoms of Parkinson’s disease patient. Younger patients can even go back to work. The major surgical benefits are seen in the control of OFF period symptoms like tremors, stiffness and pain. Patients report marked sleep benefit. The dyskinesias associated with advanced PD disappear. Basically patients get smoother ON time and for longer duration. Is there any age limit for Parkinson’s disease surgery? Though there are no specific age restrictions for this surgery, it can be said that the patient who is “young” enough to think about surgery can be offered surgery. Common age group of patients undergoing this surgery is between 40 to 75 years. The average age of our patient is around 53 years. The oldest patient has been 85 years old. Does any inter-current disease restrict surgical option? Diseases like diabetes, hypertension or cardiac problems are not a contraindication for surgery. However active infection or blood clotting disorders are contraindications for surgery. Some patients need a brain MRI if there is a doubt about the diagnosis. Levodopa challenge test is done in off medication & on medication for assessment of the symptoms in various conditions. Cognitive assessment is also performed. All routine blood investigation is done to rule out any abnormality. What is a typical Parkinson’s disease surgery like? The actual operation takes approximately three to four hours, but the entire procedure including the CT scan take five to six hours. What type of anaesthesia would I be given before the surgery? The first day of surgery would be done under local anaesthesia with fully awake to assess the clinical improvement in the symptoms like Tremors & Rigidity. Check for any other side effect. Next day the pacemaker (IPG) will be implanted under general anaesthesia. If the patient is awake, does it not cause any discomfort or pain? No, the entire procedure is completely painless and without any discomfort. However, we do have an anaesthetist and physiotherapist to look after the patient during surgery. The procedure should be performed only at a centre that has made the investment and commitment in obtaining state-of-the-art equipment and forming a multi-disciplinary, experienced team consisting of neurosurgeons, neurologists, and neurophysiologists. Jaslok Hospital and Research Centre, in Mumbai, India, is one such place where there are dedicated Functional Neurosurgery and Movement Disorder departments having the necessary expertise to perform such complex surgeries. Besides Jaslok hospital, Dr. Doshi and his team offers this surgery to Sterling hospitals, Ahmedabad. The surgery is very safe. There is negligible risk of weakness or visual disturbance. In our series (which is the largest no. 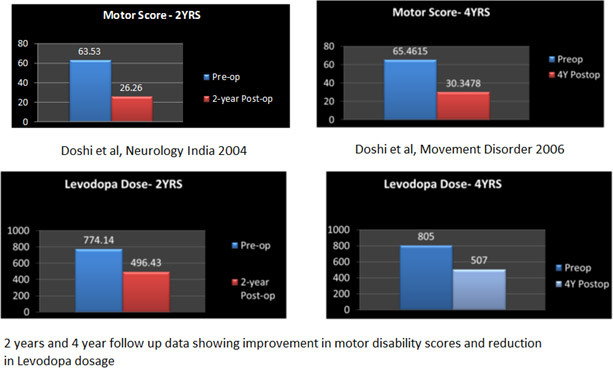 of surgeries for Parkinson’s disease performed in India) we have less than 2% risk of serious complications. When does the patient realize the benefit of surgery? The improvement is seen immediately on the operation table. The tremors disappear with similar improvement in stiffness, bradykinesia and pain. Results of Bilateral Subthalamic nucleus stimulation this surgery was started in October ’99. Till date we have performed more than 500 cases of Deep Brain Stimulation out of which there are 425+ cases are of subthalamic nucleus stimulation. We have reported our analysis at the end of two years and four years follow up in the Neurology India and Movement Disorders Journals. What should be the expected outcome of the surgery? Important in disabilities is that the patient suffers from PD. The activities of daily living improve. The patient can be independent. The duration of quality of life improves 80-85% in a day along with reduction in medicine. It improves most of the symptoms of the PD patient. Younger patient can even go back to work. Will the surgery cure hallucinations? Yes. In patients of PD hallucinations are caused by overdose of medication and also due to advancement of disease. The surgery helps in reduction of medication and also has modulatory effects on hallucinations. How long does it take the full benefit of DBS to be apparent? The improvement in Parkinson’s symptoms may take few days or 2 -3 months to reach maximum level following a programming change & medication change. Multiple programming sessions may be needed. Thus it is usually a few months after surgery. Can patients control the Deep Brain Stimulation device themselves? Following surgery the patient is given a patient access device for controlling the stimulation level as required. Patient and their care taker are trained by our specialist nurse to use this device in various conditions. It is not mandatory for them to use it, but can be used as and when needed. There are no restrictions in the no. of times this can be used in a day. How many programming sessions & follow ups will I need? Whom do I call if I have any question or any problem? The best way is to write an email. However, in case of urgency you can contact Dr. Doshi’s office. You will be also given a personal no. to call once you have undergone surgery. Whether my non-motor symptoms will improve or not? e.g. Salivation, Constipation, Sleep disorder etc.? Some of these symptoms like pain, sleep and constipation improve after surgery. However, symptoms of blepherospasm, postural hypotension, burning, salivation may or may not respond. How many days are required for hospitalization for surgery? For STN DBS, the usual hospitalization is for 12 days and for STN lesion it is 4 days. When can patient resume his daily life style after surgery? The patient is kept in the hospital for three days after thalamotomy and pallidotomy. 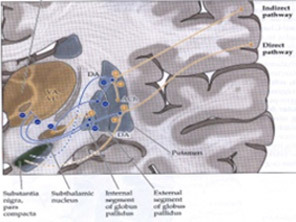 After deep brain stimulation, the patient stays in the hospital for seven days. The patient can resume his work and regular life style within one week after discharge. Is Deep Brain Stimulation surgery covered by health Insurance? Patients’ who have undergone DBS have been able to claim reimbursement from medical insurers. However, this is variable and it is best that you discuss this with your insurance provider. Can any of the operated patients be contacted to ask their opinion? Yes. The neurosurgeon needs to assess you first, then decide as to which operation is best suitable for you and thereafter can give you the address and contact details of the patients who have undergone similar surgeries.